This Friday, I celebrate 3 years of blogging! So much has happened in that time, with so many quilts made and given away. So it's time to celebrate! Because it's been 3 years, I'm having 3 days of giveaways, starting today! 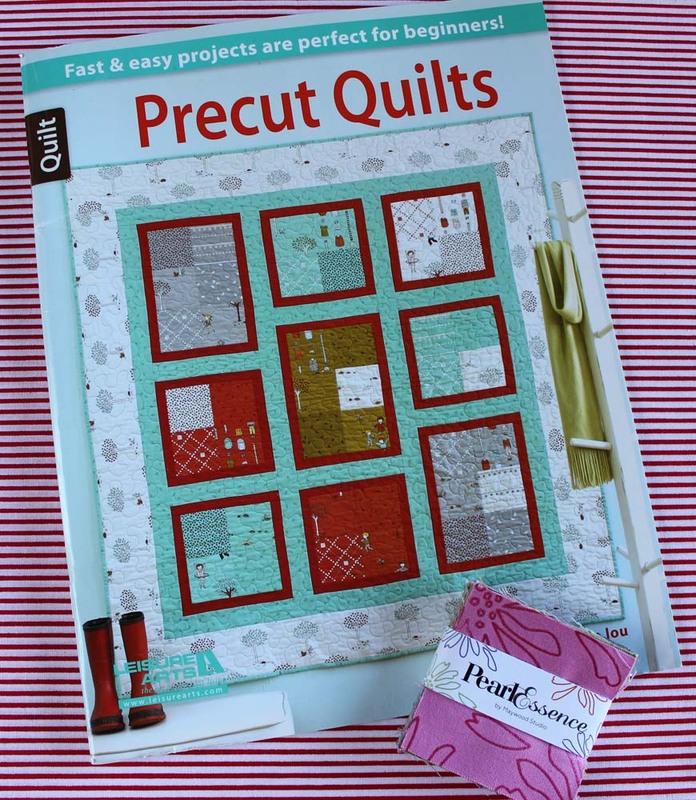 For day one, I'm sending one lucky winner this fabulous Precut Quilts book, plus a pack of mini charms! What do you need to do to enter? Just leave a comment telling me how many years you've been with your significant other, married or not! It's all about anniversaries! 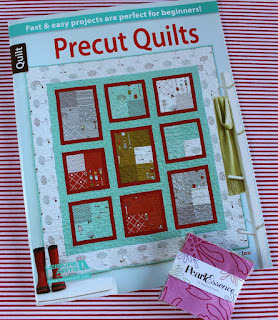 For a second entry, show your Quiltfabrication love! You can do that by following on Bloglovin, or by email. Or you can like Quiltfabrication on Instagram, Pinterest, Flickr, or Facebook. Just be sure to comment on how you show your love! Winner will be chosen randomly tomorrow morning. Be sure to check back, not only to see if you won, but to enter for giveaway #2! And happy Anniversary to you! Congratulations on three years. My husband and I will be celebrating 37 years together in February. I have been married to my best friend, school sweetheart for 51 years. I follow you by email, pinterest and instgram. My husband is my best friend and we have been married for 43 wonderful years! Thanks for the great give away chance! And congrats on 3 years of blogging! My hubby and I have been together for 31 years and married for over 29 years! I am a long time follower via Bloglovin'. Hubs and I got married in July 1977 so we are coming up on 39 years. And we still like each other! I follow you on Pinterest and by email and I would love to win a prize! No significant other for me, unless you count my baby dogs, and then it would be 8, 2 1/2 and just 3 months. Congratulations on 3 years of blogging! As for your question, I met a cute boy in 1984, married him in 1986, and we will celebrate our 30th wedding anniversary next summer. Wow! It's been three years of blogging, where does the time go? Congratulations and wishing you many more years of blogging! Of course i follow you by the email subscription and enjoy seeing what you're up too. Your posts are always nice to see and have many great inspirations. Thanks! The love of my life and I have been married for 16 years. I follow via email and Pinterest!. I have had the same sweet husband for 65 years on January 31st. I have been my husband for 33 years - have know him for 38! thanks! Congratulations on your bloganniversary.I will be celebrating 24 years married in January but met him 26 years ago. Married 34 years last month!!!! Wow!!! We had our 38th Wedding Anniversary last week. Been married to my Sweetie for 21 years..knew each other for 6 years prior. :) Congratulations on 3 Year Blogiversary to You! Married for 4 years, but together for 20 years! Am following you thru Bloglovin & Email :) Thanks for chance to win your give-a-way too! My husband & I started going out together at 15, got married 6 years later. Been married 37 years - so 43 years together! I've been married to my best friend for 42 years. I tell everybody we grew up together :-) Congrats on your blogiversary. Wishing you many more. I have been married 31 wonderful years. Been with for 12, married for almost 6! I follow your blog via email as well as following you on IG, FB and Pinterest. My husband and I have been married for 14 years. I have found my soulmate. I have been following you for a while now and I always follow blogs by email if at all possible. I like having a quilty email every moring with my coffee. Married to my husband for 38 years as of last August! I follow you via email. Thanks for the inspiration! I have been with my hubby for 15 years. My husband and I will have been married for 23 years in April! 17 years, all very happy! 41 years on the 28th. Thank you! Happy Blogiversary and may you have many more! I have been so very happily married to my soul mate for 32 years. We dated for 3 years before marriage, so it's a total of 35 years for us. I don't know what I'd do without him! I am a Bloglovin' follower of yours and enjoy it all! Happy Anniversary! I have been with my boyfriend for four and a half years, so our relationship is just a little older than your blog :) thanks for the giveaway!! And of course I am a passionate follower (via email). Thanks again!! I have been marry for 28 years and dated my husband for 5 years before that. Thank you for a chance to win. My husband and I have been together for seven years! Nov 26 was our 38th anniversary. We celebrated our 30th anniversary last May. Happy blogiversary & thanks. I'm a follower via Bloglovin'. Thanks again. Next July it will be 50 years - I don't know where the time went! Been married for 39 years but dated for 3 more. I have been with my best friend my hubby for 45 years. Will celebrate 39 years being married 2 days after Christmas. Life is grand when you love being with someone who loves you just as much as you do them. I receive your emails. Happy Anniversary!! 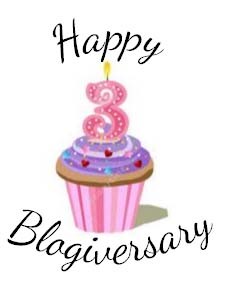 Congratulations on your 3rd blogiversary. I've been married for 44 years. My goodness - it's been a while. 32 years to be precise! Not bad for two "second timers" like us! I am following you via blog lovin. Been married 35 years - took me a minute to do that math! I've been married for 27 years. Thank you for the chance to win! Susan, thank you and I'm a Bloglovin follower. Good Bye 2015, Hello 2016! Sew Mama Sew Giveaway Time!